The Hypercom Optimum T4100 is perfect if you are looking for speed, flexibility and security. The Hypercom Optimum T4100 is one of the few terminals to support both Ethernet and dial connections. The Hypercom Optimum T4100 pushes the envelope in speed, integration and security. 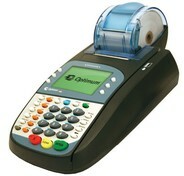 It features the Intel X-Scale 32-bit processor and IP Connection for lightning fast transactions. The Optimum T4100 uses true SSL for unsurpassed security and features integrated IP diagnostics with and integrated help system.